New York: Harper & Row, 1991. 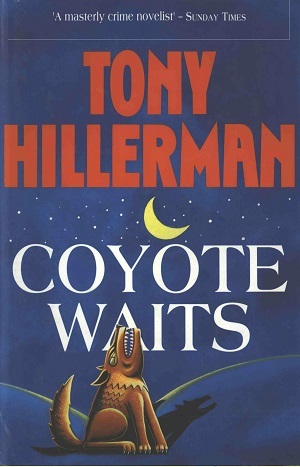 This is the first United Kingdom edition of Coyote Waits. This edition was published in 1991 by Michael Joseph Ltd, in London, England. Michael Joseph Ltd. is an imprint of PenguinGroupUK that publishes highly commercial popular fiction, non-fiction, and Top Ten Bestsellers. The cover art was designed by Kevin Hauff and depicts a coyote howling at the night sky and the crescent moon with a blue background. Binding: Blue boards and spine with the author, title and publisher's logo printed in gold vertically on the spine.